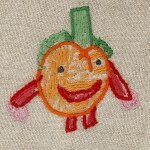 At HEARTS, they focus on quality products, and all embroidery works are made by hands of 8 embroiders. They use cork instead of leather, which is normally used for fasteners. They have a brand called “The Child Artist”, and its handmade women’s accessories capture children’s art works. They have started this line as they wanted to show children’s wonderful creativity to the world. They have been working on this project for some time, and have collaborated with institutions for underprivileged children over the past years and contributed a portion of their profits. They found out about our project on the Internet. They asked us whether we were interested in developing collaborative products, and we met and directly discussed with Tiago Viera, CEO and Patricia Costa, who came to Japan from Portugal to take part in an exhibition held at Tokyo Big Sight. 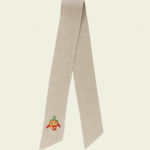 Later, among the kaki tree drawings made by children who participated in the tree-planting ceremonies and workshops, three of them were chosen for “The Child Artist” brand and twill products (scarves) have been made. They are available on their website. A portion of their sales will be contributed to the Kaki Tree Project office. The biggest challenge this time was transportation of the kaki tree. It had smoothly arrived at an airport in Portugal, but then a large amount of customs duty was charged, and the invaluable phytosanitary certificate was lost, so HEARTS had to prepare a heap of documents. Of course, we sent a number of documents from the Kaki Tree office to help them. 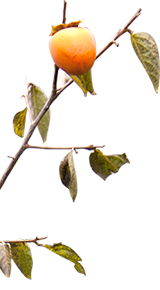 Nevertheless, the kaki tree that was dispatched on 3rd February from Japan arrived on 24th March in Portugal, and it was alive although it had taken a month and a half after shipping. 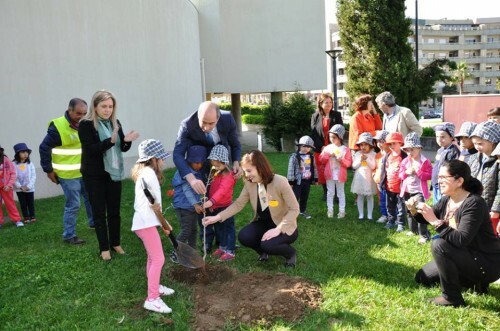 The tree-planting ceremony took place on 29th April, delayed by a month, in the garden of the municipal library of Felgueiras. 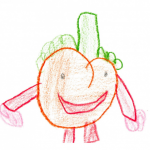 Children first listened to the story of the kaki tree inside the library, and made kaki fruit and pasted them on the big kaki tree drawn on paper during the workshop. Then, they planted the sapling from the bombed kaki tree in the garden. We would like to express our sincere gratitude to the people at HEARTS for putting themselves through the difficult situations and communication with the customs authority.